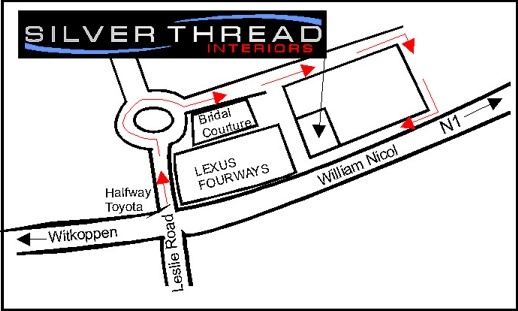 Silver Thread Interiors are specialist manufacturers of quality, custom made curtaining. Our experienced sales staff are capable of assisting you in the choice of the best fabrics and styles of window treatments to suit your individual home. Also, the added advantage of our in-house workshop allows us to completely customize any detail that you might require the curtaining to have, be it a bead, tassel, button, fringe or a combination of all of the above. Alternatively, discuss your ideas with a consultant, we will make anything that you have seen or can imagine. There are numerous options available when looking to have curtaining custom made, ranging from the style of the curtain, including style of the heading, overall look of the curtains and how much detail to put into the curtain. In order to simplify this, Silver Thread Interiors has broken these up into the following groups: Specialist Headings, Standard Taped Headings, Tab-Top, Eyelets & Rod Pocket. Goblet Pleats, Pinch Pleats, Fan Pleats, Ash Pleats, Double Barrels and additional pleats that are introduced from time to time. 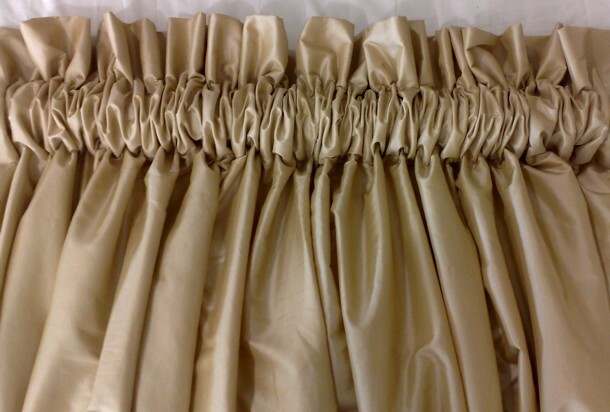 These headings are all finished by hand and we do not use any tapes in order to simplify the labour but compromise on the quality of the finished curtain. As one can expect, these are time consuming but we have been able to maintain very competitive pricing through our own in-house workshop. These include the Pencil Pleat, Kirsch (Four Prong) and Diamond Pleat headings. These headings, which are simpler in design, are still capable of completing the look of your home in that they are made to the required width and drop for each window in your home, no need to hang an odd number of curtains on a window. Also, labour specials on these include Free Make-up at times, certain conditions apply. Please refer to a sales consultant for more details. Also referred to as Loops, tab-tops are great for use with either full-round wood or metal rods. 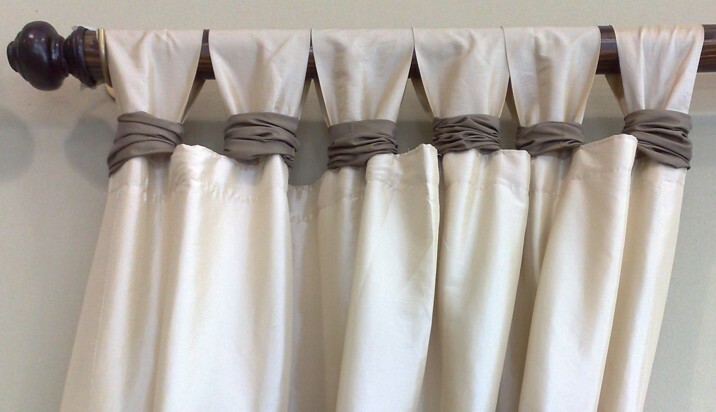 Fabric loops are stitched at the top of the curtains and these slide over the curtain rod. Options available include loops in a co-ordinating colour, buttons on the loops or fabric gathered over the loops. Though this style of curtaining has been problematic in the past with fabric loops getting stuck, products are now available to assist the fabric for smoother sliding along the top of the rod. 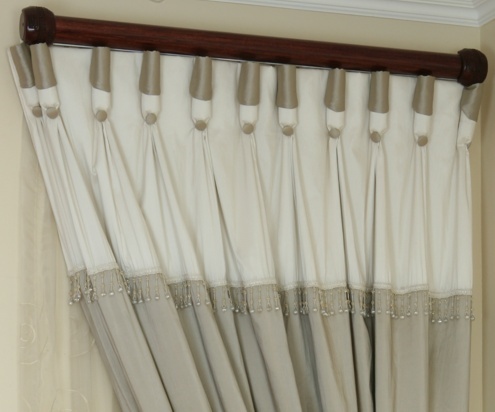 Available in both metal and plastic, both in a variety of colours, coupled with ease of installation and operation together with the neat hanging of the curtains when pulled to either side of the window have made this style of curtaining a very popular option. 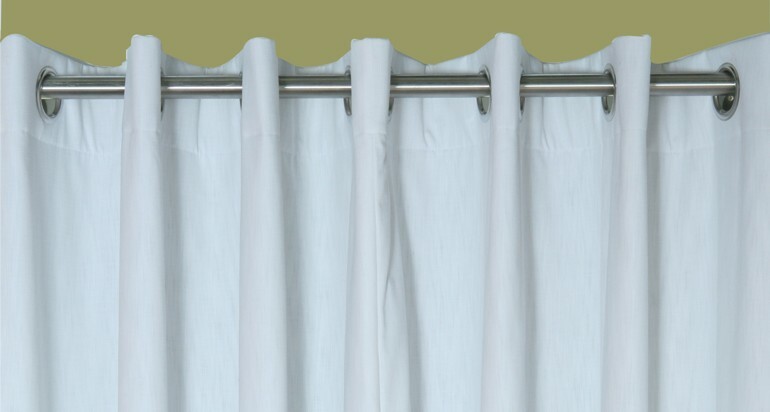 In a modern home with simple lines or in front blinds for a softer touch, eyelet curtains can also be made with a border along the side or panels of differing colour across the top or bottom of the curtain. 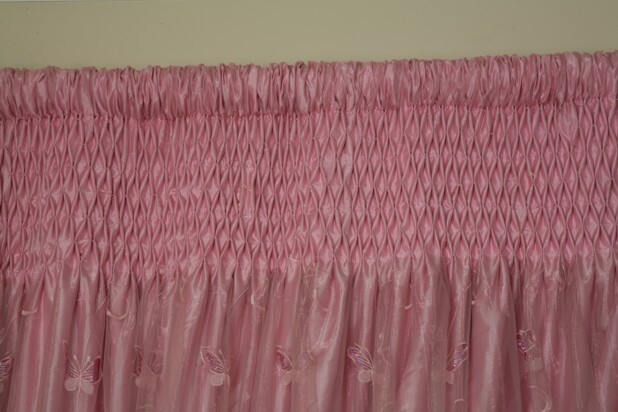 This is the simplest of any of the curtain headings and consists only of a pocket sewn at the top of the curtain. To add a difference, a heading can be added to the top of the curtain which stand proud once the curtain has been gathered onto the rod. A second pocket can be sewn for two rods to be gathered through a curtain which shows a rouched section between the two rods. Also, a pocket can be sewn at both the top and bottom of a curtain which is required to hang inside a window but not flap when the window is opened.